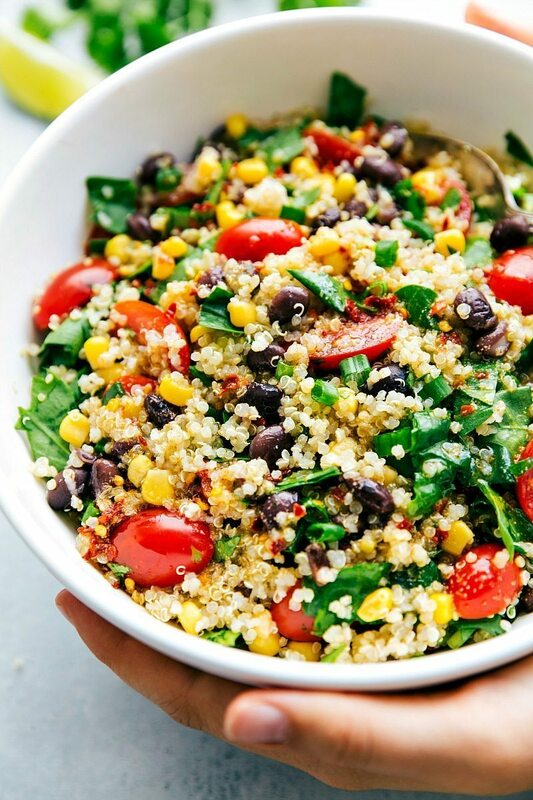 A super healthy “detox” quinoa and veggie salad made with all natural ingredients that are good for you and help to detox your body!A super healthy “detox” quinoa and veggie salad made with all natural ingredients that are good for you and help to detox your body! A delicious and healthy quinoa recipe made with all-natural ingredients. On a quinoa kick? Make sure to check out my delicious collection of other quinoa recipes as well, such as this quinoa salad, these crockpot quinoa tacos, and this quinoa soup! It’s no secret that I LOVE quinoa:) And luckily so does my whole family; we eat it in our house ALL THE TIME. Come over to dinner to my house during the week and there’s a good chance there’s a quinoa recipe being made! So what’s the deal with quinoa recipes anyway? Not only do I think quinoa tastes GREAT, it’s considered a superfood – meaning it’s exceptionally healthy and good for you. Many people use it as a substitute for white rice, and the great thing is that it’s much healthier than regular white rice: it has much fewer calories and carbohydrates than rice, with much more fiber and protein. All good things! It also pairs exceptionally well with a lot of dishes, and can be right at home in a variety of meals – such as this salad! Everyone on-board the quinoa train now?? Follow package instructions to cook the quinoa. Transfer to a large bowl and aside to cool completely. 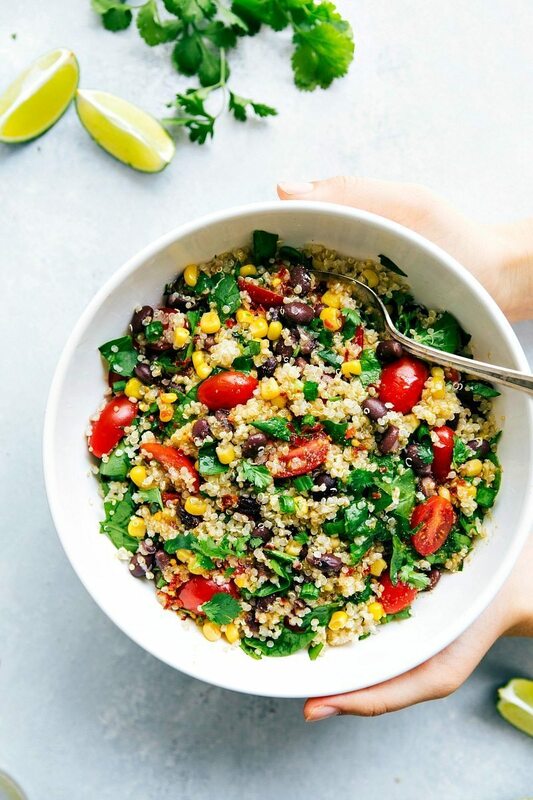 To the bowl with the cooled quinoa, add the chopped spinach, rinsed corn, rinsed black beans, cherry tomatoes, chopped green onions, and finely chopped cilantro. *Only add dressing to what you plan on eating in the same day. Unfortunately, this salad doesn’t sit super well with the dressing. If you are planning to have leftovers, toss only what you’ll being eating on day 1 with the dressing. Other than that, this salad can store in the fridge pretty well for up to 3 days. Yum, I love salads like this! We eat pretty healthy all the time (with indulgences – don’t get me wrong!) but I love this time of year when everyone is posting such great healthy recipes! And this looks delicious! I love it too! So motivating to get back on track. Like your delicious couscous salad, I need to try that out next! Happy New Year:) This salad looks great Chelsea! 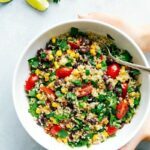 We usually try to eat a lot of veggies and salad but definitely over indulged on heavier meals and treats over the holidays so a detox salad sounds perfect:) Love quinoa but have never tried cooking it directly with tomato bouillon but it sounds fantastic and really flavorful! Thanks Kelly! Happy New Year to you as well! 🙂 I’m in the same boat haha, trying to bring in more healthy meals. I love the tomato bouillon in it, you’ll have to let me know what you think if you end up giving it a try! I’m so in need of this right now. I’ve been stuffing my face with so many horrible foods the past month, I seriously can’t bear to think about exactly how much it’s been! Great dish and great pics! I have just recently started getting on the quinoa bandwagon and this salad looks delicious! It has everything I have committed to eating more of in my life! Thanks for the recipe! This looks so amazing! I bet I could talk my man into eating quinoa if it came with black beans and cilantro, two of his Cuban-self’s very favorite things! I love quinoa, this is my kinda salad. Packed with veggies and nutrients with a “side” of quinoa! 🙂 Pinning and sharing, thanks Chelsea! I’ve never tried it either, but Thursday I’m going to make this!!!! 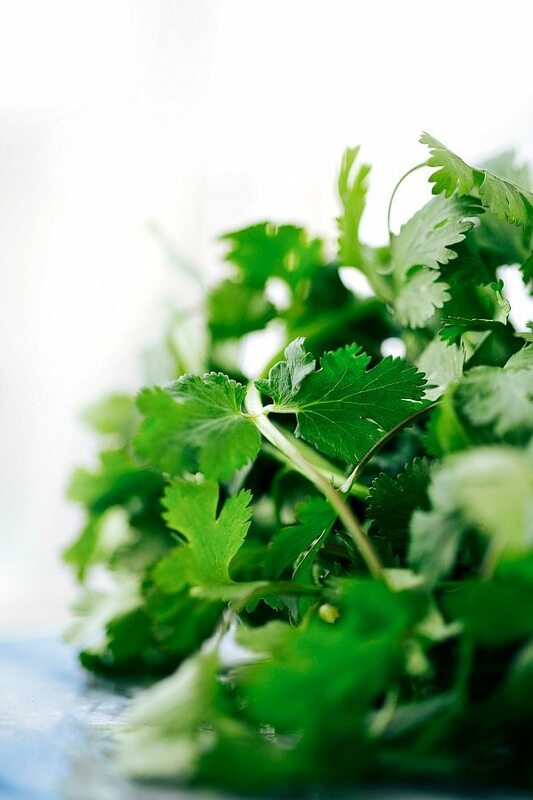 Thanks so much Julianaloh, it’s a great salad to kick off a healthier 2014! I LOVE a good quinoa salad. This looks fabulous! You have rekindled my quinoa salad desires and I am going to have to do something about it soon! Thanks Aubri! Let me know if you give this a try! We love the tomato bouillon. We get the tomato and chicken bouillon and always use that to flavor rice and quinoa when appropriate!! It’s so great huh?! I’m glad you’ve tried it and love it. Thanks for commenting Andrea! Your pictures are amazing and this salad sounds wonderful, Chelsea! I’m stopping by from the Time To Sparkle Link Party. Also, I’m your newest fan on Facebook. Pinning this recipe! Thanks so much for commenting Letty! I’m glad he enjoyed it 🙂 Have a great week! I tried this a few days ago. I was unable to find the tomato bouillion at the Navy commissary and only found quinoa that had flavors in it. I’m new to quinoa and will have to find it at another store because i love eating it. I found that this recipe was just OK. I usually love salads of this type but this one just had something missing. I experimented with different things in my individual servings to see what would improve it. I finally stumbled on it. Balsamic vinegar. a little sprinkle of that on my serving did the trick. I will be using that inthis recipe in the future. Thanks for commenting Val! Oh that’s a great idea to add Basalmic vinegar – I will have to try it! I didn’t want to add a dressing, because generally dressings aren’t a part of a detox, but basalmic vinegar would work perfectly and not take away from the detoxifying factors of the salad. Thanks again – I’ll add that to the post! Oh my gosh. Usually detox salads are so nasty and just bland. Even though this didn’t have a dressing, I loved it so much. It was so tasty and flavorful and felt good to eat something so completely healthy. Thanks for sharing this recipe, you have a new follower. So yummy. Thanks for the recipe, my family really enjoyed this healthy salad. I’m so glad they liked it! Thanks Lexy! Just wanted to let you know your detox salad is one of my features from the blog hop! Hope you stop by tomorrow to link up any new posts you have and grab a featured button. Have a great weekend! I made this and love it. It is not only delicious but very pretty with all the colors. Could you break this down as to Calories, Fat etc? Thanks so much Cheryl, I’m glad you liked it! Okay I just crunched the numbers and have a nutrition label I’m adding to the bottom of the post! Oh my! I have found your website thru Recipe Girl’s crock pot post last week. I just love your recipe’s. Keep up the great work. Oh what a fun comment to receive! Thank you so much Christien – this really meant a lot to me! 🙂 Have a wonderful week! I am going to try this. It’s been hard trying to find healthy kidney friendly meals. I’m glad I stumbled on it. LOVE those additions! Feta cheese is the best 🙂 Thanks for the comment Lauren! I love this salad. I added avocado to mine. It is a nice light salad with great flavor. What a great addition 🙂 So glad you’re enjoying this salad! Love this salad! I added avocado as well. A keeper for sure. I have made this salad 3 times now and it is my all time favourite, easy to make and low in calories. I am taking it to a party Friday night as well. Has anyone ever tried freezing this ( before adding the dressing)? Do you cook the corn and beans? I’ve just made this for my four year old who is lately a very picky eater, and WE BOTH LOVE IT!! Thank you for this wonderful recipe and for helping me get my kid to eat an unprocessed meal where the ingredients actually grew from the ground!